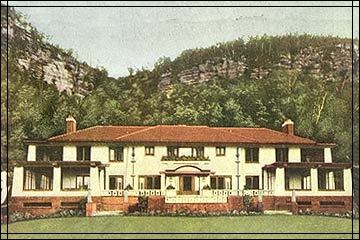 Above the central doorway of Rockledge, Maher used a flattened arch, a commanding architectural element that echoed the solidity of the bluffs looming just behind the house. He adopted the tiger lily, abundant at the site, as a motif for decorations within the house. Maher's "motif-rhythm" theory took the idea of a unified interior, as practiced by Wright, Purcell, Elmslie, and other Prairie School architects, a step further. He believed that repeating a few motifs consistently throughout the house, so that one was surrounded by them, would make the home-and, therefore, the inhabitants' lives-harmonious. Because the Kings were among his wealthiest clients, Maher designed lavish interior details and nearly every object that would be used at Rockledge. The flattened arch and the tiger lily were the prevailing interior architectural motifs. Rockledge was demolished in 1987, but its furnishings were saved, and they, along with period photographs, illustrate how successfully Maher realized his version of a unified interior. An armchair, a runner, an urn, and the tea service from Rockledge are in the collection of The Minneapolis Institute of Arts.